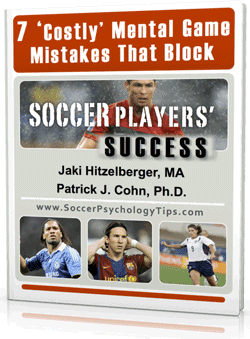 For soccer players, investing in your confidence pays huge dividends on the field. Playing during critical moments of important games. Effectively rebounding from bad plays or calls. 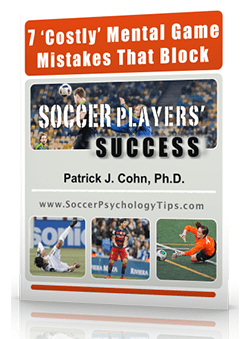 The opposite of confidence is doubt and fear (fear of failing, fear of making mistakes, fear of disappointing others, fear of losing playing time, etc.). With both doubt and fear you will notice they are products of your focus. Confidence is grounded in a present moment focus. Doubt is a focus on past failures or mistakes while fear is a focus on future outcomes or worry about outcomes. A present moment focus empowers you to go out and “play your game” despite the game circumstances. If you recall some of your best games, you will realize you were just playing, totally immersed in the flow of the game, rather than thinking of potential outcomes. Cristiano Ronaldo is a forward for Real Madrid and, at 29 years of age, is considered by most as one of the premier players of his era. Ronaldo is known for his unwavering confidence as well as his prolific goal scoring. You want to focus on performing well. Focus on your game, the things you do well. You must be able to identify your strengths and assets and mold your game accordingly. When you step onto the pitch, get your game face on. During the final moments of pre-game preparation, you need to switch from thinking mode to instinct mode and immerse yourself in reacting to what’s happening. Concentrate on your own job. You should focus on what you need to do “now” and not what has already happened. 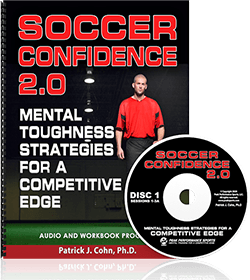 Get the competitive edge in soccer today with our Soccer Confidence Workbook and CD Program!